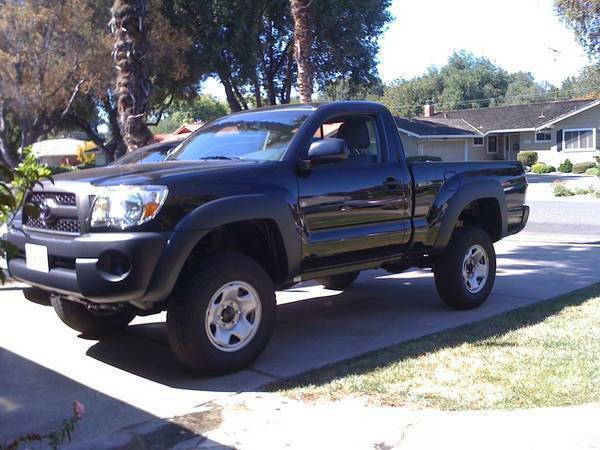 Discussion in '2nd Gen. Tacomas (2005-2015)' started by yv1650c, Sep 30, 2010.
does it look too much bad? I put on Ol Man Emu last weekend and my tires are still on order. I snapped this pic with the factory 245/75R16s on steelies. The 265R70s are a little fatter than that. You decide. ehh, from the looks of that, i would buy the lift but wait to install it until i get new tires and wheels. no offense bj, just saying. I can live with the look for a few days. It was more important to me to make sure I didn't have any unfixable/unsolvable mechanical problems with the suspension before I went plunking down an additional 1500 for wheels and tires. If for some reason I was going to have to back out the suspension change, I didn't want to be stuck with wheels and tires I couldn't use. Even more importantly, this way I'm only changing one thing at a time. If I get vibration (and I did get a minor one) I know for sure it's a driveline vibration issue not a tire balance issue -- so I know how to go about solving it. If I had changed tires at the same time, I couldn't be sure. For now, i'm calling it the "gangly teenage look" stretched out, but not filled in. For now, i'm calling it the "gangly teenage look" stretched out, buit not filled in. I dont want to remove the mudflaps, what would be the best tire size? OME, no removing factory mudflaps - 265/75R16 or 265/70R17 - which is a little larger than stock, and requires trimming or removing the mudflaps at stock ride height, but shouldn't with OME lift. I didn't have any rubbing with my 265x75R16's on stock shocks. With and without my ARB bumper on the front. It's really hit or miss with the rubbing at that tire size. I got an OME lift with 285/70/17 and didnt have to remove my front mud flaps. I not sure if its due the height of my tires but I did have to trim a little!